Garden Sanctuary! Lovely Single Family Home located on a wide, tree lined street! 3 Bedrooms 2 baths within a spacious and open floor plan. Nicely updated kitchen with granite counters, stainless appliances, reverse osmosis water system and plenty of storage. The oversized master has an ensuite bath w/ shower and tiled floors. Original hardwood oak floors in the living area with recessed lighting, ceiling fan and oversized windows allowing full view of the well-tended flourishing garden. This home has been well loved and well maintained and includes a living and edible garden full of lavender, ginger, blueberries, sage, aloe vera, mint, gardenias and rosemary. There are peach, apple, lemon, banana and apricot trees, two kinds of grapes and gorgeous hibiscus flowers, this is just to name some of the wonderful growing, living plants and shrubs thriving here. 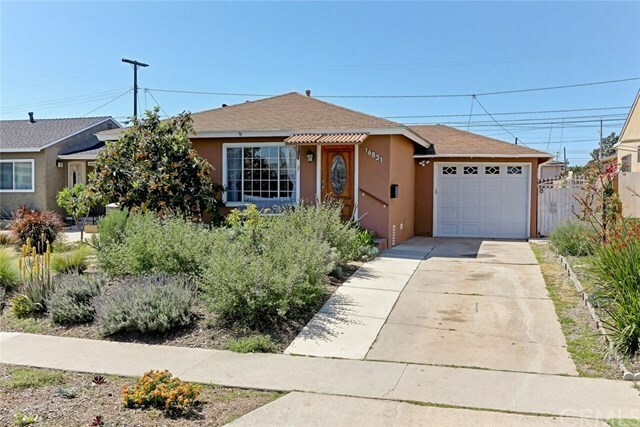 Enjoy this wonderful single family home located near the Gardena Willow Wetlands Preserve and the Arthur Lee Johnson Park, where the tennis is free! The local elementary Denker Ave School participates in the unique and highly regarded Korean Dual Language Immersion Program, loved by all who attend! This home is also conveniently located near the 91 and 110 freeways for ease of commuting. There is so much more, this one is worth it, come see for yourself! !